Clean and wash the methi leaves & chop finely. Take a bowl add wheat flour,gram flour,turmeric powder,chilli powder,salt ,chopped methi leaves & add little water & make a soft dough. Apply little oil over it & allow to rest min 20 mins. Take the dough, make a small size ball , dust with flour & using the rolling pin make a flatten it. Heat oil in a pan, deep fry the flattened dough both sides. Serve hot with any curry or masala gravy or raithas. மிகவும் வித்யாசமான பூரி. பார்க்க ஜோராக தேங்காய் போளி போல உள்ளது. வெந்தயக்கீரை உடம்புக்கு மிகவும் நல்லது. பகிர்வுக்கு நன்றிகள். பாராட்டுக்கள். Healthy and tasty looking pooris. Wonderfully prepared. LOooks yummy! I always love methi theplas! More healthier and yummy too! 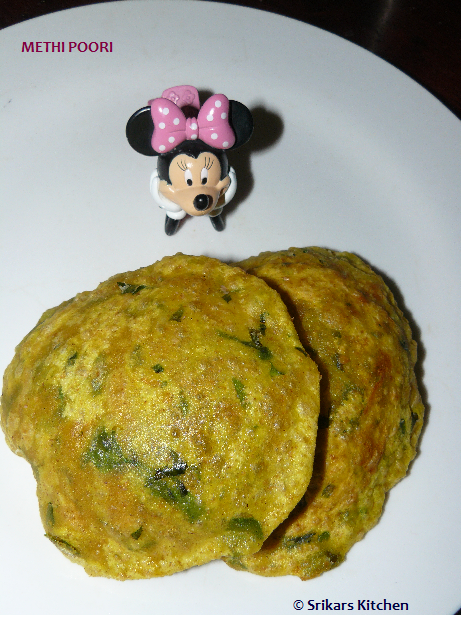 a very healthy and flavorful poori :) looks so yummy dear ! !